The Voltex® Hybrid Electric Heat Pump reduces water heating cost by up to 73% through an innovative design that pulls environmental heat while dehumidifying and cooling the ambient air at the same time. The HHPT-80 uses heat pump technology to deliver tremendous savings. 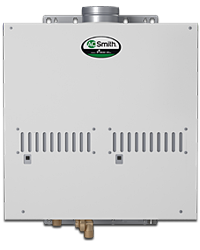 The 80-gallon (nominal) tank enables you to maximize your savings by generating heat through the heat pump technology instead of the heating elements. It also offers premium features like a user-friendly LCD display, vacation mode, and a powered anode that protects your tank for 6 years. In addition to the heat pump technology, this model also has two heating elements that help the water heater recover quickly during periods of high demand. Long-lasting incoloy heating elements, 240V/2000W lower and 240V/4500W upper, helps heat water when in conventional Electric or Hybrid modes. Select from Efficiency, Hybrid or Electirc operating modes to match heating requirements to environmental conditions. Protects steel tank from corrosion and maximizes tank life. 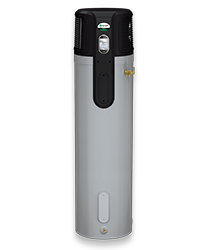 The Voltex Hybrid Electric water heater utilizes heat pump technology to provide a more efficient way to heat water with electricity. 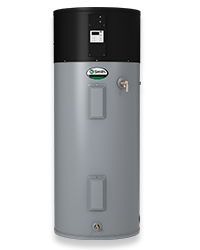 The Voltex® Hybrid Electric Heat Pump water heater has been designed to dramatically decrease the cost of operation and translates into significant savings for the homeowner. It's twice as efficient as a standard electric water heater and can cut annual operating costs by more than half.